Norristown is a home rule municipality in Montgomery County, Pennsylvania, 17 miles (27 km) west by north of Philadelphia, on the Schuylkill River. It formerly was a borough operating under Pennsylvania's borough code, its official name is "The Municipality° of Norristown" and it is frequently referred to as "the borough" even in statements by its officials. However, since 1986, Norristown has been governed under its home rule charter, that was updated in 2004., not under Pennsylvania's Borough Code. Norristown is in a rich agricultural region; in the past, it had extensive manufactures of cigars, tacks, wire, screws, boilers, bolts, silos, tanks, iron, hosiery, knitting machines, underwear, shirts, lumber and milling machinery, paper boxes, rugs, carpets, etc. As of the censusGR2 of 2000, there were 31,282 people, 12,028 households, and 7,144 families residing in Norristown. The population density was 3,421.5/km² (8,871.6/mi²). There were 13,531 housing units at an average density of 1,480.0/km² (3,837.4/mi²). The racial makeup of the borough was 54.32 % White, 34.80 % Black or African American, 0.20 % Native American, 2.96 % Asian, 0.03 % Pacific Islander, 4.61 % from other races, and 3.07 % from two or more races. 10.49 % of the population were Hispanic or Latino of any race. Of the 12,028 households, 28.7 % include children under the age of 18 living, 33.7 % were married couples living together, 19.8 % have a female householder with no spouse present, and 40.6 % consist of individuals who are not related to one another. The census reports 32.7 % of all households made up of individuals and 9.2 % have someone living alone who is age 65 or older. Norristown’s average household size is 2.52 and the average family size was 3.22. In the municipality° the population covers a broad range of ages with 25.1 % younger than 18 years of age, 10.5 % from 18 to 24 years, 32.6 % from 25 to 44 years, 20.1 % from 45 to 64 years, and 11.8 % who were 65 years of age or older. The median age was 34 years. For every 100 females there were 94.9 males. For every 100 females age 18 and over, there were 92.8 males. The median income for a household in the borough was $35,714, and the median income for a family was $42,357. Males had a median income of $32,113 versus $26,746 for females. The per capita income for the borough was $17,977. Norristown’s population includes 17.2 % living below the poverty line. Of the families, 13.5 % have incomes that are below the poverty line. 23.6 % of those under the age of 18 and 13.8 % of those 65 and older were living below the poverty line. Norristown has a °manager/council form of government a seven-member municipal council. The office of mayor was abolished in July 2004 after a corruption scandal which led to the conviction of several borough officials and mayor Ted LeBlanc. The municipality is part of the Sixth Congressional District (represented by Rep. Jim Gerlach), the 149th and 150th State House Districts (represented by Rep. Jay Moyer and Rep. Mike Vereb) and the 17th State Senate District (represented by Sen. Constance Williams). Excluding the large boroughs of Alaska, Norristown was one of the larger communities under the borough form of government. The borough form of government permitted the city to be protected by volunteer fire departments,as does a Home Rule Charter, for example. Located on the Schuylkill River, it was established as a mill town and as a seat of county government. At one time Norristown was a retail center for the rural areas outside of Philadelphia. With the growth of suburban communities and large shopping malls including the Plaza at King of Prussia and the Plymouth Meeting Mall in the outlying townships, Norristown’s retail sector steadily declined and eventually collapsed. Today the city’s economy is powered by Montgomery County government jobs, the legal profession, and health care. Montgomery Hospital and Norristown State Hospital are located there. While the downtown has suffered in recent years, the residential areas of Norristown remain largely well-maintained. The housing stock in Norristown is unique and remains affordable. Row homes abound, as do twin homes and some single family residences. The city is a transit center and the Norristown Transportation Center is the terminus of the Norristown High Speed rail line and a stop on the former Reading Railroad Norristown train to Center City Philadelphia (both now are part of the regional transit system called the Southeastern Pennsylvania Transportation Authority). The Norristown Times Herald is the city's daily newspaper, printing Monday through Saturday and serving most of Montgomery County. A Sunday edition is also published. Norristown is steeped in and surrounded by history. Valley Forge National Historical Park is nearby. The city is named for Isaac Norris, a member of the colonial Pennsylvania legislature who ordered the casting of the state house bell that became known as the Liberty Bell. Norris was given a grant of land, then called Williamstadt (William's Town), in honor of one of its founders William Trent who sold the land and went on to help found Trenton, NJ. The Municipality of Norristown and the adjacent Townships of East and West Norriton now occupy this former estate. Norristown has a rich musical tradition as it was the home to several famous jazz musicians. Bass virtuoso Jaco Pastorius and keyboard legend Jimmy Smith were both born in Norristown. The census count of Hispanics in Norristown is thought to be a vast understatement because of the increasing number of illegal immigrants, many of whom are fearful of deportation should they participate in government surveys. Mexican workers from the state of Puebla have found residence in the borough for its affordable housing stock and proximity to construction, service sector, and landscaping jobs in the wealthy suburbs that surround it. Norristown enjoys a mix of Mexican Americans, African Americans, Italian Americans, and Irish Americans that can be seen in its ethnic neighborhoods. There is also a visible Jamaican-American community. Because Norristown had been in population decline for much of the second half of the 20th century, many look to immigrants as vital to the borough's revitalization. The local government accepts Mexican Matrícula Consular cards as valid identification, in an effort to prevent immigrants from being marginalized in the community or becoming the victim of criminals who know that the undocumented have no legal recourses. Norristown is located at 40°7′12″N, 75°20′30″W (40.119884, -75.341701)GR1. According to the United States Census Bureau, Norristown has a total area of 9.1 km² (3.5 mi²), all land. I was born in Norristown, PA, less than an hour away from Philadelphia. My parents are Martha and Charles Borgard. Much of what is good in my life I owe directly to them. I have a brother Charles and a sister, Elaine, both of whom work in the private sector. 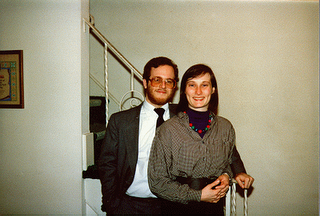 I am married to Laura Clark, a clinical psychologist who practices at the state's John Umstead Mental Hospital, and is an adjunct faculty member at UNC-CH's Psychology Department. 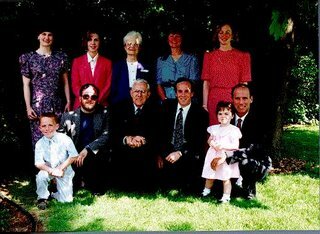 The back row: Charles A. Clark (my brother), Charles H. Clark (my father), Elaine Borgard (my sister), Bill Borgard (my brother-in-law), and me. The front row: Sherri Clark (my sister-in-law) holding Tim Clark (my nephew), Martha Clark (my mother), and Laura Clark (my wife). Not in this picture: Kelley Borgard and Tanya Borgard (my nieces). The back row: Laura, Tanya, Martha, Sherri, Elaine. The front row: Tim, me, Charles, Charles, Kelley, Bill. My wife and I have two children, David and Elizabeth. They rule the family now but we love them anyway. 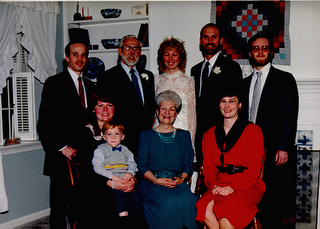 Here is the latest Clark family portrait, in honor of my parents fiftieth wedding anniversary. 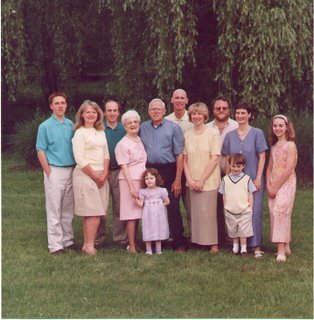 The back row: Tim, Sherri, Charles, Martha, Charles, Bill, Elaine, Jeff, Laura, Kelley. The front row: Elizabeth, David.